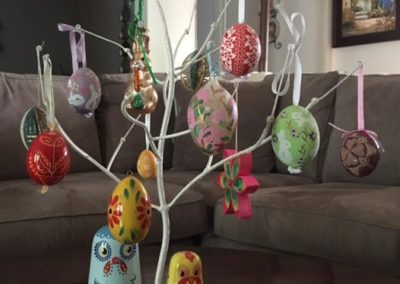 For several years I have used painted and decorated eggs in my Easter decorations. 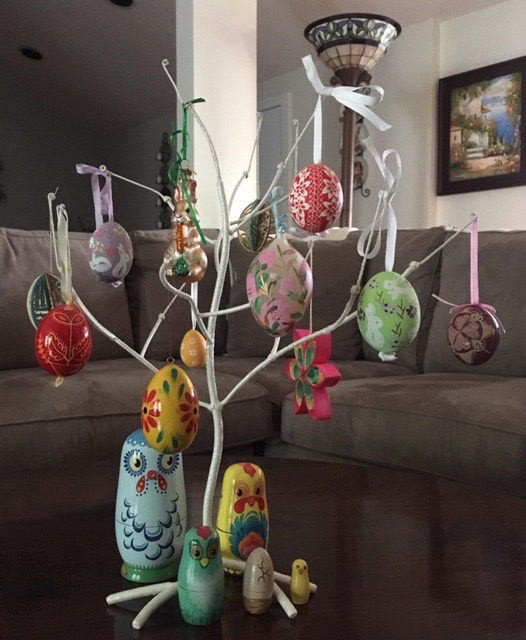 Among my decorations is a small Easter Egg tree adorned with painted eggs and handmade Pysanky eggs. 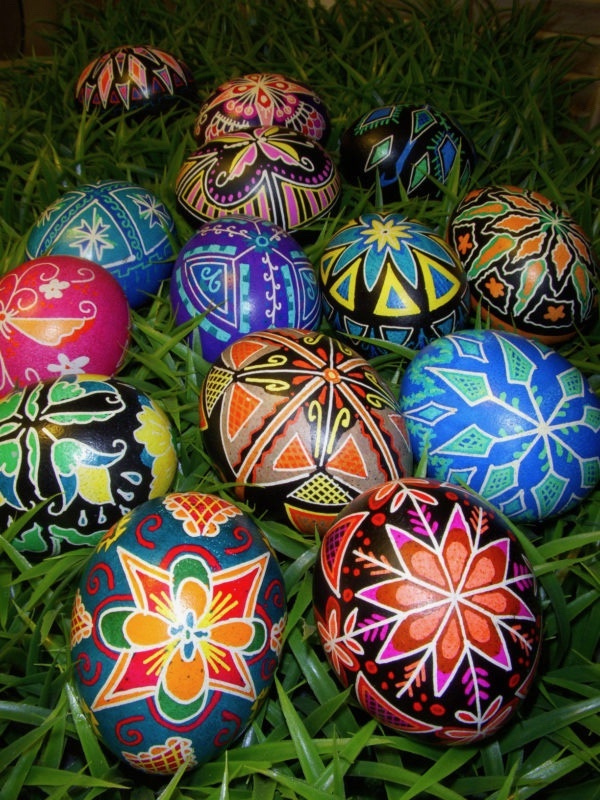 If you are unfamiliar with Pysanky eggs, they are a tradition within the Ukrainian culture and Orthodox church. 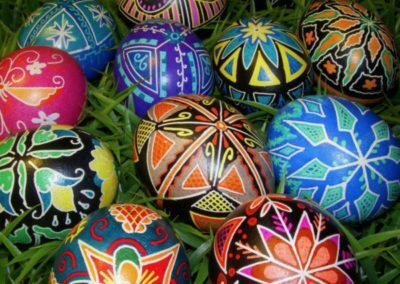 For centuries Ukrainian people have written Pascal (Easter) greetings to friends and family members on eggs instead of paper. These messages of health, prosperity, wealth, new life and hope through the Resurrection of Christ are not expressed in ordinary script. 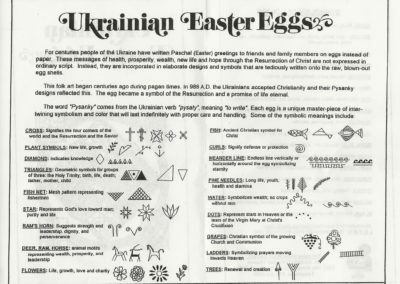 Instead, they are incorporated in elaborate designs and symbols that are tediously written onto raw, blown-out egg shells. According to literature from St. Barbara Orthodox Church in Fort Worth, Texas, the folk art began centuries ago during pagan times. 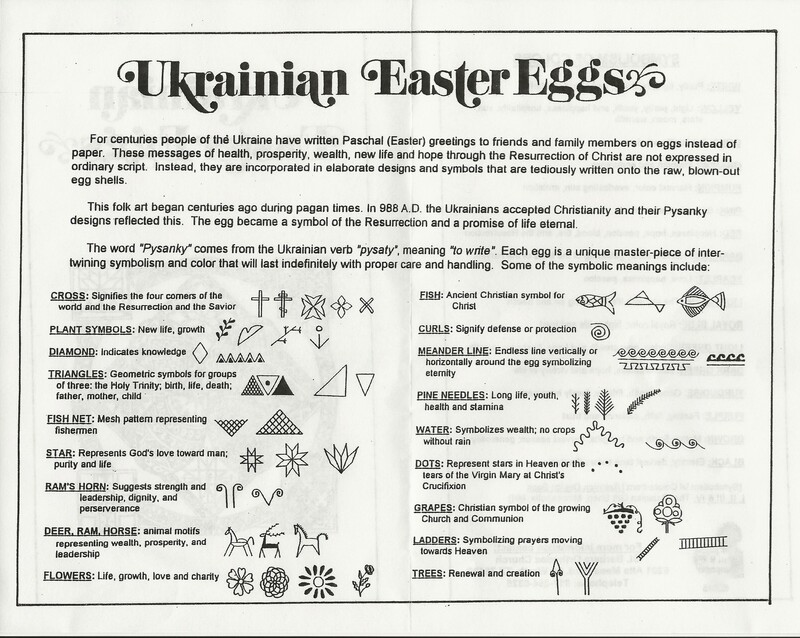 In 988 A.D. the Ukrainians accepted Christianity and their Pysanky designs reflected this. The egg became a symbol of the Resurrection and a promise of life eternal. 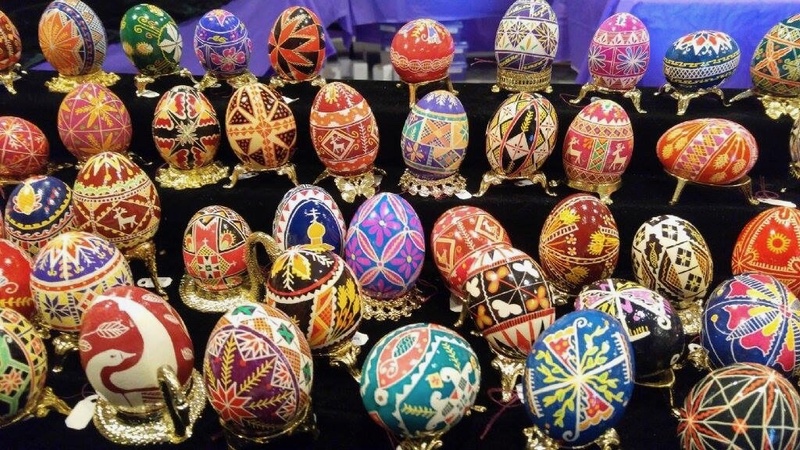 The word “Pysanky” comes from the Ukrainian verb “pysaty”, meaning “to write.” Each egg is a unique masterpiece of intertwining symbolism and color that will last indefinitely with proper care and handling. 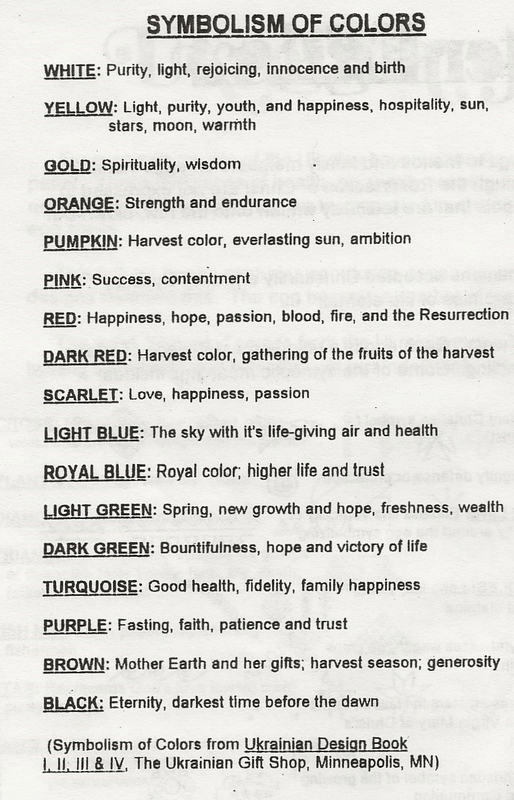 Numerous symbols and colors depict different messages. 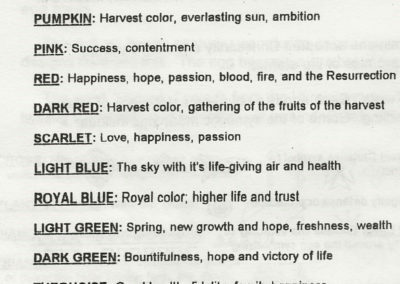 Following is a sampling of the specific designs and colors and the symbolism they represent. 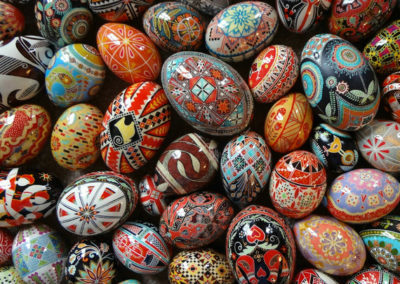 So, how are these beautiful eggs made? They are decorated by a complicated dye process similar to batik. Pure beeswax is heated and applied with a stylis or kistka to the raw, white egg. The egg is dipped in multiple dye baths. Between each dipping, wax is applied over areas where the preceding color is to remain. After the final color has set, all the wax is removed and the varnish is applied. 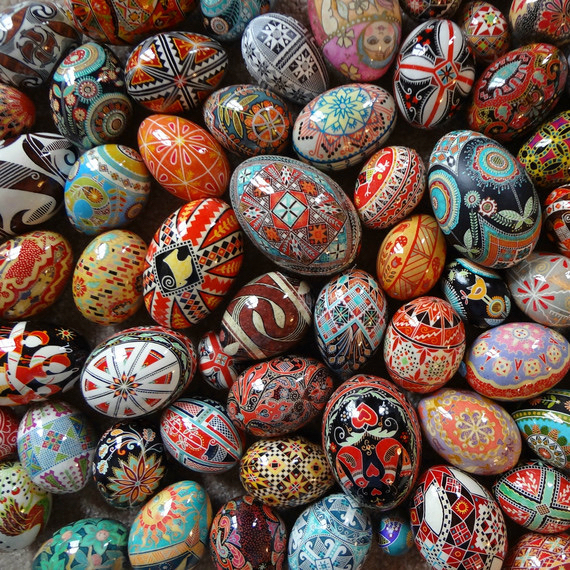 With careful treatment Pysanky will last indefinitely. 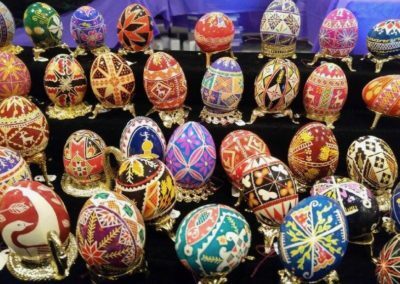 If you, like me, are enthralled and amazed with these amazing creations, I encourage you to contact a local Orthodox church to see if they have a Pysanky Festival where you can begin or add to your personal collection. Verlie McAlister Edwards was raised in Abilene, Texas and it’s there that she realized her love for writing. She enjoyed a special high school English teacher who happened to be the school’s newspaper sponsor. In order to take another class under her, Verlie signed up for journalism and the journey began. Unlike many students, she never changed her college major – she was always focused on journalism as a career. She graduated from the University of North Texas (UNT) with a degree in journalism and political science. After graduation she returned to her hometown and worked as a reporter at the Abilene Reporter-News covering the local education scene from the students’ perspective. Following a year of graduate work at UNT she moved to Fort Worth where a career in public relations and political affairs flourished. She always wanted to work in academic PR and achieved that goal early in her career at the Texas College of Osteopathic Medicine. After many years providing public relations consultation to the osteopathic profession and serving as the communications director/special events fundraiser for Lena Pope Home (a residential treatment facility for abused and neglected youth) she joined the staff of the Greater Fort Worth Association of Realtors (GFWAR) as the communications and governmental affairs director. It’s here that she found her calling and further developed her skills in the political arena. 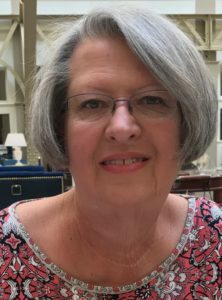 After 11 years in that position she took her writing, political and organizational skills to serve as chief of staff for Texas State Representative Rob Orr, a past president of the GFWAR. She remained on Rep. Orr’s staff throughout his 10 years as an elected official and then served as District Director for his successor, Representative DeWayne Burns, during his first legislative session. At that time she retired from the Texas Legislature and began working part-time as curator for U.S. Congressman Roger Williams’ personal museum. Verlie is excited to use her writing skills to help the Iron Butterflies Project as both a writer and Vice President and Editor-In-Chief.